^ Quickfacts.census.gov - Hamilton County Archived 2011年7月11日, at WebCite - accessed 2011-12-06. ^ New York. Laws of New York;1816; 39th Session; Chapter 120; Section 1; Page 16. ^ New York. Laws of New York;1837; 60th Session; Chapter 238; Section 1; Page 227. ^ Aber, Ted, and King, Stella (1965). History of Hamilton County. Lake Pleasant, New York: Great Wilderness Books. pp. 51..
^ New York. Laws of New York;1860; 83rd Session; Chapter 178; Page 298. ^ New York. Laws of New York;1915; 138th Session; Chapter 718; Section 1; Page 2364. 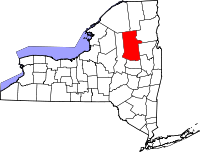 ^ Hamilton County Public and Private Airports, New York. Retrieved June 13, 2013.